Níscalos--a wild mushroom found in autumn. 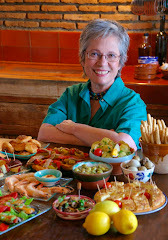 This week I bought wild mushrooms at my local village market. 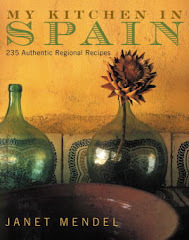 They were níscalos, Lactarius deliciosus (saffron milk cap), a distinctive orange-fleshed wild mushroom found in many regions of Spain after fall rains. Their heady, forest aroma reminded me of the time I went wild-mushroom-hunting, many years ago. Our expedition was to a small pine forest right off the main coastal highway (southern Spain). The previous week, my foraging companions had picked four different kinds of mushrooms here. On this particular autumn day the sandy soil was soft underfoot from rains a few days before. We started off into the woods, adults and children. Within seconds, Salvador, head of the expedition, had pulled up two, three, four, five boletos (one of the boletus varieties). He stopped long enough to show them to me and off he went. The smallest were twice the size of ordinary cultivated mushrooms, with a tawny cap and an underside of a decidedly poisonous yellow. Broken open, the mushrooms revealed a pale, creamy-yellow flesh. I headed off slowly, eyes on the ground, dodging low-hanging pine branches which snagged my hair and scarf (a case of not seeing the forest for the mushrooms.) The eye is at first too quick, too far-ranging to spot these sly, secret growths. It takes a certain myopic concentration to begin to apprehend their mysterious presence. Stopping to turn and search under each pine, I saw right at my feet, a rise in the thick springy carpeting of pine needles. I brushed off the needles and there it was, a big boleto. I squatted beside it, pondering its awesome, underworld power. Gestating in darkness, it chooses its particular moment to push up through heavy, damp earth and dense layer of pine needles to shine in the light of day, as if to take a look around. Unlike other plants, fungi contain no chlorophyl, and are not nurtured by the process of photosynthesis. Light and air are, to them, a mere curiousity. I suspect them of ulterior motives. It is as if they wait until they hear you coming to reveal themselves. Pockets here and there in the forest covering indicated the ground was well picked over. But this one, my first mushroom, had waited for me. I picked it and wandered on, farther and farther from the group, holding my talisman before me. After a while that little piece of pine forest, within earshot of the highway, seemed to become enchanted. A heavy silence swallowed the sounds of traffic. At one point, just as a light rain began to fall, I could have sworn I saw an elf, some tiny being sitting on one of those toadstools. I did, for certain, see a rabbit and a snake. The boletos were not the only mushrooms I discovered. There was an incredible variety—tiny, tiny white ones, like underground pearls, popping up through the pine needles to encircle a tree. Brown, shiny ones, like chocolate drops, and amongst them, pale, beige and white “flowers,” presumably the same mushroom fully opened, a delicate spiral that looked as if it would waft away in a breeze, until I touched it and found it had the same spongy density as its neighbors. I left undisturbed the many varieties I couldn’t identify. Even armed with a book, which provided descriptions and photos, I felt a little chill of terror at the thought of confusing a possibly deadly poisonous fungi with the edible ones. When we regrouped, the morning’s catch was spread out on a big tarp for inspection. They were all boletos this time, except for a few big white field musrhooms, which looked just like the cultivated ones at the grocery store. They were of all sizes, the biggest as broad as a six-year-old’s face. 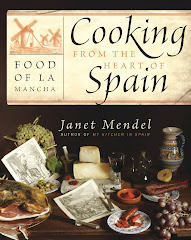 Salvador, his hands black from picking them, sorted through the mushrooms and pitched the wet and soggy ones, a rotting stew of spores. The rest were cleaned of dirt and pine needles, then divided among three families. At home, I sautéd the mushrooms with olive oil and garlic, parsley, salt and pepper, and, once they had exuded all their liquid, some dry Sherry. They tasted only vaguely like cultivated mushrooms. The texture was like a cross between snails and raw oysters--chewy and slippery at the same time. The flavor was darker, duskier, muskier, woodsier, the opposite of ethereal. An appealing taste, evocative. Elves and fairies, cushions of pine needles, raindrops, teardrops, sighing winds, downy blankets made of mist, and the smell of damp earth. All mushrooms are a little magic. 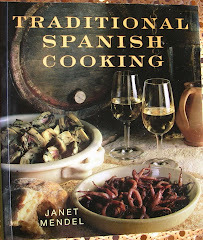 Today, in the kitchen, although I missed the thrill of the hunt, I was delighted to be cooking wild mushrooms. 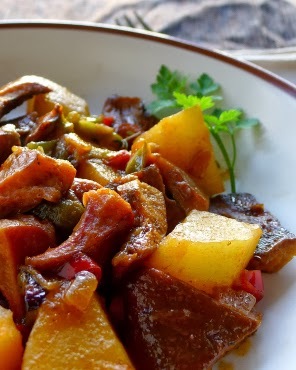 The níscalos are an exceptionally meaty mushroom and inspired me to make a guiso de patatas y níscalos, a mushroom and potato stew. 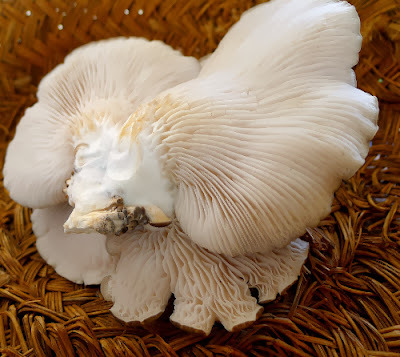 White cultivated mushrooms in Spain are known as champiñones. 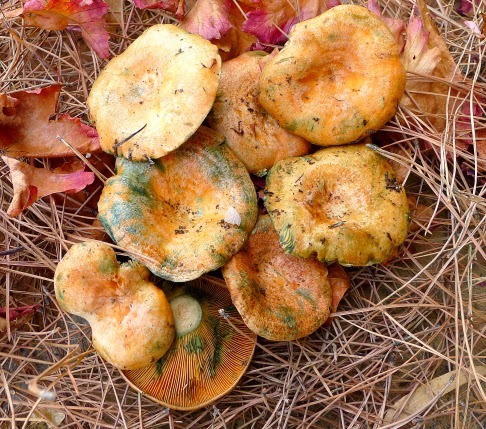 Edible wild mushrooms in general are called setas. Hongo means fungus and can be applied to edible mushrooms as well as toadstools or even fungus infections. A few tips for cooking with mushrooms: Place mushrooms in a basket or loosly wrapped in paper until ready to use. Don’t wrap them in plastic or refrigerate or they will begin to get slimy. Use a damp cloth or soft brush to clean the mushrooms. Don’t wash them in water. Cut them or pull them into segments immediately before cooking. 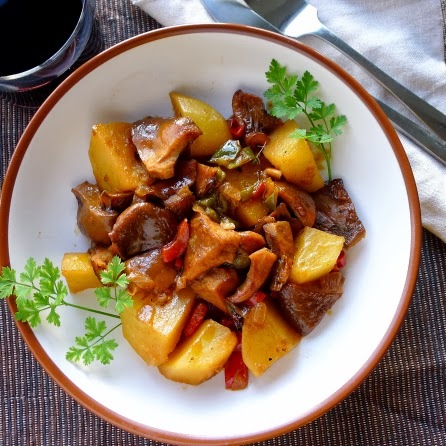 Wild mushroom and potato stew, a delicious fall dish. Use a damp cloth to clean the mushrooms. Cut or tear them into pieces. Heat the oil in a pan and sauté the red and green pepper, onion and garlic until softened. Add the mushrooms and continue to sauté until they lose some of their liquid and begin to brown. Stir in the pimenton and red pepper flakes, if using. Add the potatoes, wine, water, salt and thyme or rosemary. Cover and simmer until potatoes are very tender, about 30 minutes. Serve hot, garnished with parsley. 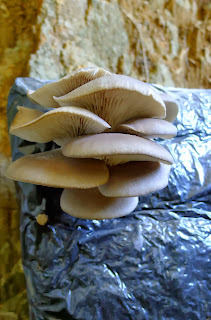 "Grow bag" with oyster mushrooms. The wild mushrooms whetted my appetite for more funghi. 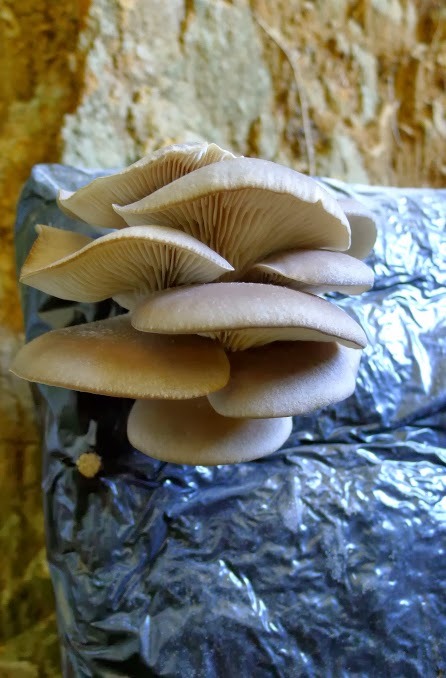 A few days later, at a local garden shop, I spied a mushroom “grow bag,” (filled with mulch and straw, it is inoculated with mushroom spores) already sprouting oyster mushrooms. I couldn’t resist bringing it home and harvesting a pile of them to cook with regular cultivated white mushrooms. 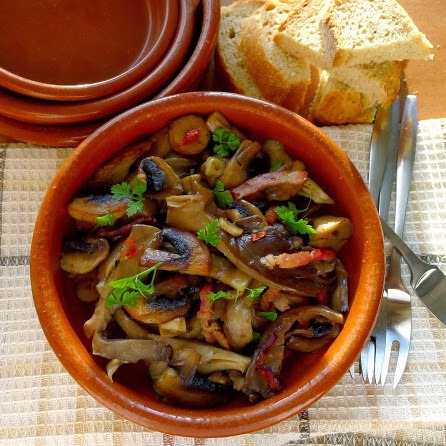 Mushrooms sauteed with garlic, a favorite tapa dish. 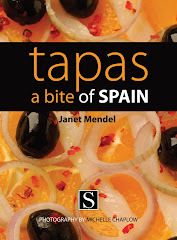 Makes 6 tapas or sides. Clean the mushrooms immediately before cooking. If they are large, cut them in half through the stems, then slice them thickly. Very small mushrooms can be quartered. Heat the oil in a large frying pan. Add the garlic, bacon or ham and chili and sauté 2 minutes. Add the mushrooms and continue sautéing, about 6 minutes. 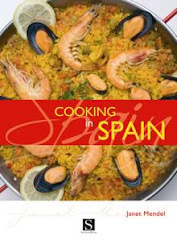 Add the salt and Sherry and cook 6 minutes longer. Stir in the parsley. Serve the mushrooms hot.